Calahonda is situated on the shores of the Mediterranean on the Costa Del Sol in Spain between Marbella and Fuengirola which are only 10 minutes drive away. Just 25 minutes to the east is Malaga airport so access is quick and easy. There are various options for getting to Calahonda, car hire being the most popular as you can then explore the region at your leisure. This development is mostly popular with foreigners from northern Europe and especially with people from the United Kingdom. If you want a taste of Spain, then Calahonda is not for you. This development is self-sufficient and designed for tourists in mind. It is not a former fishing village like many of the popular Costa del Sol resorts which have expanded due to the tourism – instead it is a purpose-built development. It is not hard to understand Calahonda’s popularity when you look at the facts. It has a fantastic climate with less than 50 days of rain a year and with an average temperature of 18°C. See our weather page for more details. The accommodation is mainly built of luxury villas and apartment blocks and holiday complexes which stretch from the coast to the hillsides. On these urbanisations are great sports and leisure facilities such as tennis courts, a riding club and a golf course with four more courses close by and many more a short drive away. The nearest golf courses are at Calanova golf club and Club de Golf La Siesta. There are plenty of bars and restaurants to suit all tastes as well as shopping centres, banks, chemists and international medical centres. You also have the reassurance if you fall ill and sick on holiday of having the Hospital Costa del Sol nearby. Bring your EHIC card with you and you will be entitled to free emergency medical treatment. Families love the area because they can simply relax with all the facilities they need in close proximity. Young children will also enjoy the tourist train which takes you around the resort complexes. Head for the nearby marina which has a great choice of bars and restaurants and the best beaches in the area where you can enjoy watersports such as windsurfing and jet skiing. Miles of golden sandy beaches go all the way to Marbella and it is even possible to walk there if you wish. Calahonda has a lovely long 4km stretch of sandy beach (Torre de Calahonda) with port (Puerto Cabopino) and a number of pretty villas and urbanizations with apartments which back the beach area. There are a number of Chiringuitos (beach bars most of which serve food too) scattered along the beach. The lovely natural sand dunes at Cabopino are just 2km away and here you will find the nudist beach. As you can see this is a beach and harbour which hasn’t been overdeveloped (in our opinion) despite the development beside the marina of luxury apartments and townhouses. Tell us below in the comments section. Many of the restaurants and bars in Puerto Cabopino have been here before the area was developed so there is a real feeling of character with most of them. The beach at Cabopino is wide and clean and overlooked by an ancient Moorish watch-tower. You can hire sun beds and umbrellas to be able to relax in comfort. Well there isn’t a huge choice here but we recommend Albert’s on the Port and Hermosa and the Spanish El Puerto where you should try the freshly-caught fish, yum! Across the road try Italian restaurant Da Bruno a Cabopino. Where to park? 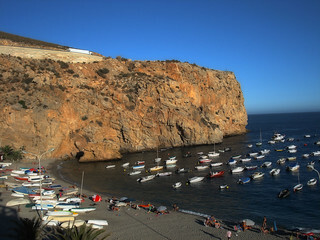 There are usually plenty of spaces in the port just a short walk from the beach. Head west to the more built up and glamorous resort of Marbella which attacts the rich and famous at venues such as Nikki Beach and the Ocean Club or head east to Fuengirola which has a lot of nightlife with clubs such as the Karbon Klub hosting some top DJ’s. Calahonda is popular with expatriates, especially British people who have either moved here on a permanent basis or who have holiday homes and spend a significant amount of time here each year. Much comes down to the self-sufficient nature of the development which has all the facilities you need such as medical centres, banks, shops, bars, restaurants and golf courses. Technically there is no need to leave the area as all these facilities are within a very short distance of each other which of course is very convenient especially for older retirees who are less mobile and less inclined to keep jumping in the car constantly. In many parts of Spain, public transport is either unreliable or non-existent which makes Calahonda even more attractive as a place to retire to. There are an increasing number of young families moving into the area and the options for schooling include both Spanish state schools (in La Cala de Mijas), International schools (EIC) and private Spanish schools (Las Chapas and Ecos). But of course what Calahonda does lack, is a little bit of history and character, but it makes up for that with convenience, so you take your choice depending on your priorities. Our property and estate agents pages have more details. Mostly Calahonda is made up of apartment blocks, many of which are timeshares or holiday homes. Many people let these out either on long-term rentals or short-term holiday lets. Popular areas include: the Urbanisation Riviera del Sol, Urbanisation Sitio de Calahonda, Urbanisation Royal Beach, Urbanisation Jarales de Alhamar, Urbanisation Calypso, Urbanisation Finca Ana Maria and Urbanisation Casa Fuerte. A trip just 2km away to Puerto Cabopino is a must as this has been described as the most picturesque port on the Costa Del Sol. There are some fabulous beaches here as well is popular restaurants such as Alberts and Giuseppes Pizzeria. Heading east you will come to Miraflores, a popular golf resort with the bowling club. Further you come to Fuengirola and Mijas. Set inland perched on the mountains is Mijas Pueblo, Andalusia’s most popular traditional white village which is well worth a visit to get a feel for the real Spain and to enjoy the sweeping views of the Costa del Sol. If you enjoy walking, head past the El Portón complex and you will come to a small Christian monument from which you will be able to see the whole coast on a clear day as well as Africa and Gibraltar. Use our map of Sitio de Calahonda to find your way around. The heart of Calahonda is visible from the main CN-340 road. Here you will find many restaurants and shops, mostly in the El Zoco commercial centre. There are all sorts of types of restaurants serving most types of international food from British to Japanese to Italian and lots more in-between! There really is something for everybody here. For health-conscious visitors, head for the Club del Sol which has a gym, tennis courts, paddle-tennis, swimming pool and aerobic classes. There are plenty of good quality supermarkets many of which have products familiar to you back in the UK, although this being Spain you may be surprised by the lack of choice on the shelves. The El Zoco has a relatively small Supersol supermarket which is open from 9am to 9pm. There is a slightly larger Supersol near the Los Olivos complex. The Mercadona is one of the best-known supermakets in Spain and is competitive on price. Located in the Los Jarales area of Calahonda. The well-known discount retailer Lidl is situated near the Cabopino area. We have already touched upon the fact that the bigger resorts of Marbella and Fuengirola are the places to head for serious nightlife, but what of Calahonda itself? There are certainly bars such as the Trafalgar Bar in the El Zoco complex which opens until 3am most nights. David’s Bar in the neighbouring urbanisation of Riviera del Sol it is also worth a visit. For eating out, the Restaurante La Mandrágora in the El Zoco commercial centre is regarded as perhaps the best restaurant in Calahonda with its mix of Slovakian and Mediterranean cuisine. If you know of any better then please let us know! 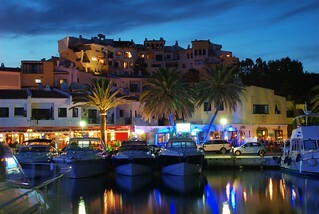 Address: Centro Comercial el Zoco, 29649, Mijas-Costa, Sitio de Calahonda, Spain. Telephone: 952 93 04 40.